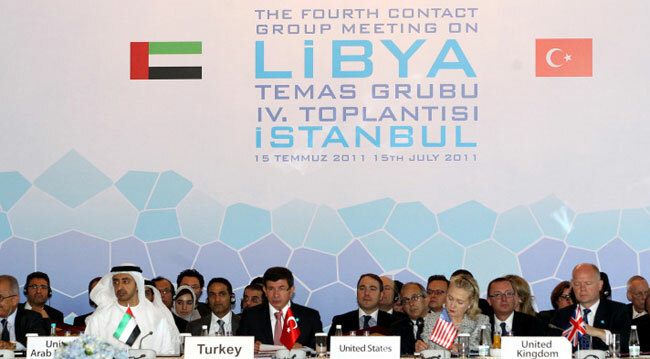 Libya Contact Group Meeting started in Turkey's economic hub of Istanbul on Friday. In the beginning of the meeting Turkish Foreign Minister Ahmet Davutoglu made a speech regarding last developments in Libya. Davutoglu has called for maintaining international pressure on Libyan leader Moammar Gaddafi as top diplomats from the members of the Libya Contact Group gathered in Istanbul, the fourth edition in the series of their meetings, on Friday to continue discussing an exit-strategy from the Libya crisis. "We have to keep up the pressure on the Tripoli regime in line with Security Council resolutions to launch a transition process with an eye to secure a new political setting, both reliable and sensitive to the legitimate demands of the Libyan people," Ahmet Davutoglu told his counterparts in an opening ceremony of the meeting at Istanbul's Ciragan Palace. Davutoglu said international efforts should be coordinated with Libya's National Transitional Council or NTC, Libya's rebel council that had won a great deal of international recognition as the sole representative of the Libyan people. The Turkish foreign minister stressed that the Libyans were in need of cash ahead of the upcoming Islamic holy month of Ramadan, saying members of the contact group should release at least part of the Libyan assets they had frozen in their respective countries to generate an aid of 200 million USD. Davutoglu reiterated strong support for the UN chief's special envoy to Libya, Abdelilah al-Khatib, saying "he will lead the efforts to lay the foundations of the transition process. The contact group's support for al-Khatib will strengthen his hand in his dealings in Libya." UAE's Foreign Minister Abdallah bin Zayid Al Nahyan said on Friday that everyone wished to see a new and democratic Libya. Delivering a speech in the fourth meeting of the Libya Contact Group in Istanbul, Al Nahyan said that they appreciated Turkey's role in organization of the meeting. 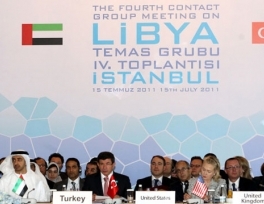 Al Nahyan said he believed that the meeting would contribute to fair cause of Libya. Great efforts have been exerted on international platform for Libya to protect Libyan people, he said. Al Nahyan recalled that international community called on Muammar Gaddafi to give up power in previous meetings and decided to form a fund to assist Libyan people. UAE's FM Al Nahyan said that they appreciated works by Transitional National Council for the cause of Libyan people. "All we want is to see a new and democratic Libya. Gaddafi regime causes instability in Libya and North Africa," he said. Al Nahyan said that a road map must be drawn for Libya, stating that they wanted a Libya living in peace and providing a great development to its people. UAE hoped that Libya would have a place it deserved in Africa, Arab world and international community, he said. Regarding Thursday's militant attack in southeastern province of Diyarbakir that killed 13 Turkish soldiers, Al Nahyan offered his condolences to Turkish government and people, and said that 'terrorism' still existed there. International community must do what was needed to fight against terrorism, he added.